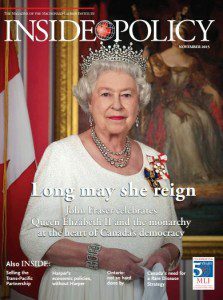 Inside Policy November 2015: What should we expect from Canada’s new government? OTTAWA, Nov. 9, 2015 – On the campaign trail Justin Trudeau promised Canadians “real change”. But will life really be that much different under Canada's newly-elected prime minister and the governing Liberals? In the November 2015 edition of Inside Policy, the magazine of the Macdonald-Laurier Institute, contributor Ian Lee argues that while there will be real differences in style and tone, the Trudeau Government is likely to stay the course on the Conservatives’ economic plans. “What Election 2015 revealed was that Canadians wanted Harperism without Harper”, writes Lee. “Canadians wanted a much nicer, more-gentle, cuddly Harper. His name is Justin Trudeau”. Dr. Durhane Wong-Rieger argues that we need a better approach to tackling 7,000 rare diseases that affect nearly three million Canadians. To read the full edition of the November 2015 edition of Inside Policy, click here.